At the TDN, we’re always looking for well-written, hard-working, dedicated people who love the industry to join our growing staff. Specific opportunities, when they exist, are listed below. If you’d like to send us your resume and a cover letter, please email suefinley@thoroughbreddailynews.com and let us know why you’d be a perfect member of our team. 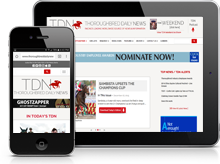 There are currently no positions open at the TDN. Please check back at another time.